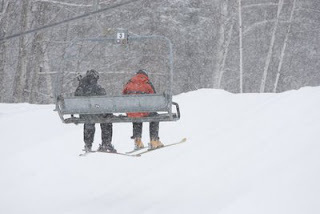 Cranmore Blog: Another Whopper Snowstorm! Just a quick note to say Cranmore is in this current snow storm's sweet spot with up to two feet of snow forecast between now and tomorrow. So far there is about 4-6 inches of snow on the ground right now and it is still snowing like crazy. This is my seventh winter season working at Cranmore and I would rate this as the second best ever - right behind last year's record-breaking snowfall. And there is still PLENTY of winter left so who knows where this one will end up in the record books. Best of all, we have not had any of the "freeze/thaw" cycles that often happen up here in ski country. That means all of the snow that we made, plus all of the natural stuff, has piled up and stayed put. 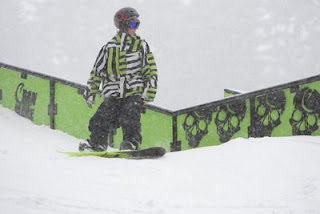 Conditions have been consistently packed powder surfaces and now, thankfully once again, with a sweet powder topping. Those of you braving the roads today will already find half a foot of snow on top of the groomed stuff. By tomorrow morning, look for powder all around, especially in the woods and on trail's edge. I know the Super Bowl is on Sunday and maybe you think this is reason enough to skip coming up for the weekend. I hope this snowfall convinces you how bad an idea this is. To make it easier, drop into our estore by Friday and buy a "Sunday Morning Solution" lift ticket. It is valid until 12:30pm on Sunday and is only $45. That way you can ski Sunday morning and still make it home in time for the big game. Big snow and big savings - what a great combination for Super Bowl weekend!